I would like to thank my very own dear little Sis Redge for sharing me these trio awards. We share a lot of things being the only sisters in the family, we're only three siblings, Big brother, Me and Redge, our youngest. I convinced her to join the blogging world and it's been a year now since she started her own site last year March 22. 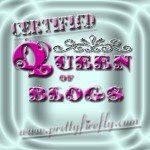 Now we're blogging sisters and it's fun! Thanks sis. Appreciate these awards! I am now passing these awards to my friends.. JennyL, Lainy, Mira and Liza.